Smooth sided boolits and tumble lube? Thread: Smooth sided boolits and tumble lube? Do these boolits w/o lube groves work, if so how well, with tumble lube? I know they are used to powder coat. Are there any other advantages? Lead displaced from the rifling will ruin your bases. What if they're gas checked? I've been working with a no-groove Arsenal design for one of my .308s. Loading it 'as-cast', even with tumble lube, isn't likely to work 'cause the both the (bore-rider) nose and the base drop a couple thousandths undersize to allow for application of PC before final sizing. Fresh out of the mold, the nose and base of my 188-grainer mike .2985 and .3075, respectively; which I size to .300 and .310 after PC. Haven't really investigated thoroughly but I suspect, if you check the mold-makers specs, you'll find almost all PC-dedicated designs are going to cast on the small side. The problem with a plain body bullet is lube. The lube groove, exists to hold lube, and to dispense that lube; as the bullet makes it's trip down the gun barrel. 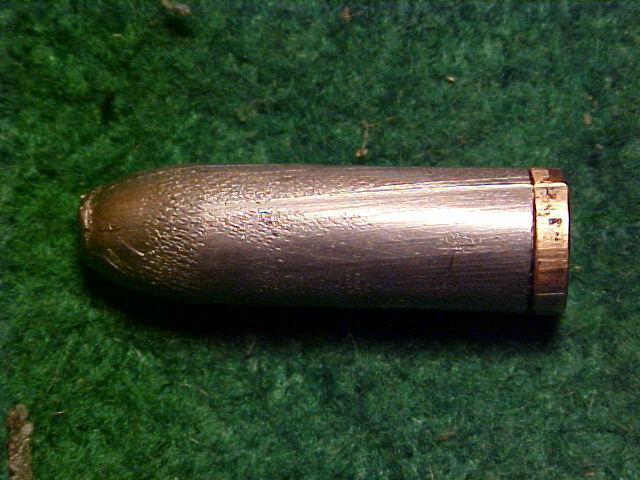 A lube coated cast bullet, (without lube grooves), may well not carry sufficient lubricant for that entire trip. The result will be leading at the point in the barrel where the lube runs out, ...and from that point, on to the muzzle. I believe on most, you are correct on the sizing. BUT the Arsenal sure seem to be accurate. The 6 mm sure does fit my lothar 6x45! Obviously, for a semi pistol it does work. I have NOT had any luck with PB in rifle (3 30 cal) using BLL and any soft (SOWW) alloy pushed very hard. GC helped a little. COWW worked OK & accuracy is better with the GC. Groove or groove-less doesn't matter, pressure and alloy do. If the gas checks are not attached firmly enough to keep from falling off the thousands of psi pressure behind them should keep them pushed in place. If lead displaced by the rifling will trail behind the base and deform it why doesn't it happen with ordinary cast bullet bases? Why doesn't the lead following the last lube groove get pushed aft likewise? Should we be lubing the forward driving band so it doesn't cause leading before the first lube groove gets to the bore? Why is it that most bullet designs for auto-loading pistols have a single lube groove well back? Some think the lube distributed by the bullet currently being shot is primarily for the benefit of the following shot. That is why a lot of shooters traditionally fired a 'fouling shot' before getting down to serious work. BTW, I tumble lube all my pistol and revolver bullets with JPW and don't get lead fouling after 500 rounds or more. Accuracy is heavily dependent upon the bullet leaving the barrel with minimal disruption. Deformities/anomalies on the base cause much larger accuracy problems than deformations anywhere else. NLG (no lube groove) boolits are designed EXPRESSLY for use with Powder Coating....NOT grease. I have NLG molds for 223, 9mm, 38, 40, and 45 cal and can see absolutely NO difference in performance. Just use your standard groove boolit molds you now have for PC. Don't waste money buying NLG molds that will only be of interest to un-enlightened PC'ers in the future if you ever wish to liquidate them. Some may disagree, but on the whole, PC only replaces grease as a lube and the PC sticks to the Pb where grease will come off if not in a grease groove for the journey down the barrel. All my MANY (!) grooved cast slugs shoot just fine with PC. And I always use GC's wherever the load data dictates high velocities/pressures that can gas cut the slug....PC or not. PC is NOT a replacement for a Cu GC. Would you use grease as a replacement for a GC??????? I think not. Think of PC is a modern day easy greaseless smokeless lead-free way of lubing a boolit. Good luck and happy loading! If powder coated works , i see no reason why tumble lube will not. Only soft alloys push lead to the base, even with a lube groove. Mine are beefier since I use 1 1/2" round bar and 1/4" sprue plates but certainly similar in principle. I made my first moulds like this for paper patching and they certainly work well for that. Then I decided I'd make a full groove diameter mould for my .44 mag Marlin because I was getting such bad leading from the Lyman 429421 that cast at 0.429" so undersize in the Marlin. I figured I used a lube cookie under the boolit like BP guys do. That worked fine and lo and behold leading gone and accuracy improved and this using full house "J" bullet load data. I decided I'd make one for my .303 Lee Enfield as well since my Lyman 314299 cast at 0.312"/0.313" so undersize for my 0.314"+ groove diameter. Guess what... it worked well. I made the boolit profile similar to the 314299 but bigger to suit bore and groove so a two diameter bore riding boolit. I tumble lubed those in a home made mixed and it works well for me. In fact so far the best accuracy I've gotten from that old gun is with a 215 gr. smooth boolit tumble lubed with groups running 1 1/2" at 50 yards. These are moderate cast boolit loads using both IMR4198 or mostly IMR4227. The next option is to make the boolits slightly undersize then knurl and tumble lube. The knurling isn't a new idea and should allow somewhat higher velocities due to more lube available. However, the smooth boolits in bore riding design have worked pretty well for me with no leading issues and decent accuracy. So, yes in my opinion if the boolit is a good fit to groove and has enough surface outside the brass to hold tumble lube it can work satisfactorily. Not much different than the old outside lubricated lead bullets (which .22 rimfire is). Not really. Here is a boolit that seats firmly into an unsized neck so it's bigger than the groove diameter. Somewhere I have a photo of that boolit with a gas check (it's a nose pore mold so the gas check can be inserted into the mold over the base plug). The boolit gets, knurled so there is somewhere for the lube to go. Sometimes the knurling is still visible in the land impressions but not in this case. In this case, the 'lube' was actually metal polish, the idea being to polish up a rough bore (I ended up polishing it with abrasive pads which worked very well). Anyway, you can see there is some dragging of metal at the end of the land impression but it does not form feathering because of the small renate and chamfer at the boolit base. Without that chamfer I was getting trailing edge feathering, but I'm not sure what effect the feathering has. Ok, not the identical boolit but a fat one just the same. This one was fired in a two-groove which displaces a lot of metal. Last edited by 303Guy; 04-27-2018 at 04:35 AM.